Jazz trumpeter Arturo Sandoval, a four-time Grammy winner and protégé of the legendary jazz master Dizzy Gillespie, will perform in concert with the award-winning Whitworth Jazz Ensemble on Saturday, Nov. 6, at 8 p.m. in Cowles Memorial Auditorium at Whitworth. Admission is $15 for adults; $10 for students/senior citizens over 62. For tickets, call TicketsWest at (509) 325-7328, or purchase online at www.whitworth.edu/musictickets or http://www.ticketswest.com/. Tickets also can be purchased at the Whitworth Information Desk in the Hixson Union Building on campus. Sandoval will conduct a free jazz clinic for Whitworth students, Spokane-area students, and the general public on Friday, Nov. 5, at 5:15 p.m. in the Music Building's Recital Hall. Middle school and high school students who attend the clinic will receive a free ticket to the Nov. 6 concert. For more information about the concert or clinic, please call (509) 777-3280. "Arturo Sandoval may be the best-known jazz artist Whitworth has hosted in our 22 years of annual guest artist jazz concerts," says Dan Keberle, professor of music and director of jazz studies and the jazz ensemble at Whitworth. "He's one of the top three jazz trumpeters alive today, and I'm thrilled that Whitworth students as well as the entire Spokane community will have the chance to hear a live performance from such an amazing musician." Sandoval, a native of Cuba who now is a U.S. citizen and lives in Miami, is fluent in musical languages from bebop to classical. He began studying classical trumpet at age 12 and has since developed into one of the world's most renowned jazz trumpeters and flugelhornists, as well as a celebrated classical artist, pianist and composer. Sandoval is known for his virtuoso technical ability and his specialty in high notes, and his versatility is showcased on recordings with artists ranging from Dizzy Gillespie, Bill Conti and Stan Getz to Johnny Mathis, Frank Sinatra, Rod Stewart and Alicia Keys. In addition to his award-winning albums, he was commissioned by the Kennedy Center to compose the music for the ballet "Pepito's Story," choreographed by Debbie Allen. Sandoval was a founding member of the Grammy Award-winning group Irakere, whose explosive mixture of jazz, classical, rock and traditional Cuban music reverberated throughout the entertainment world. In 1981 he left Irakere to form his own band and was voted Cuba's Best Instrumentalist from 1982 to 1990. He has garnered four Grammy Awards, six Billboard Music Awards and an Emmy Award, the latter of which he received for his composing work on the underscore of the HBO movie based on his life, "For Love or Country." Sandoval also performs classical music regularly with leading symphony orchestras from around the world. He composed his own "Concerto for Trumpet & Orchestra," which can be heard on Arturo Sandoval: The Classical Album. He has been selected to perform with orchestras on primetime television and he was asked by esteemed composer and conductor John Williams to record Williams' original Trumpet Concerto with the London Symphony Orchestra. Sandoval also serves as a professor at Florida International University and works with educational institutions worldwide to offer scholarships, exercise books, clinics and seminars. In addition, Hal Leonard Publishing has released education books with recorded CDs that include original exercises by Sandoval and has published various big band, combo and marching band charts from his albums. 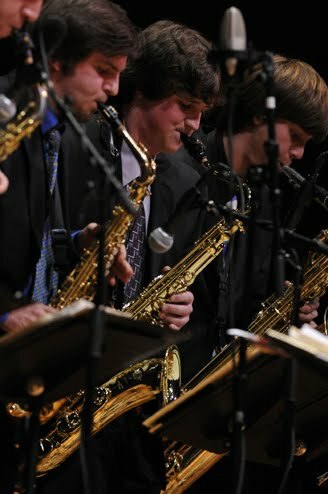 The Whitworth Jazz Ensemble, which will be one of two college jazz bands selected from six Northwest states to perform at the Music Educators All Northwest Conference to be held in Bellevue this February, won first place at the 2010 Lionel Hampton Jazz Festival; the ensemble has won first place at the Hampton Festival eight times since 1994. The 18-piece ensemble performs several concerts each year on campus, as well as at jazz festivals, in public schools, at civic events, and on annual tours throughout the United States. In January, the ensemble toured New York City and New Orleans; in January 2009, the group traveled for the seventh time to Rome, Italy, for several performances with leading Italian jazz artists. In January 2006 the ensemble traveled to Sao Paolo and Salvador, Brazil, for concerts at two music festivals. Other performance residencies in previous years have included trips to Hawaii, Havana, Munich (twice), Rome (six times), and Australia, where the ensemble logged nine performances at the Melbourne International Jazz Festival and in the surrounding area. Joan Lack or Loree Swegle, program assistants, music department, Whitworth University (509) 777-3280, or music@whitworth.edu.